Since the early 1990s, emojis have gained rapid popularity among the digital sphere, peppered everywhere from text messages to web pages all over the world. Similarly to keyboard symbols, these emoticons have become such an integral part of our daily lives that they are now being used almost as a universal language, from educational campaigns to classrooms. Many of us at UBC can vividly remember the floorgraphs and posters around campus that sought to raise awareness about consent and sexual assault. According to the UBC consent campaign website, research suggests that people react to emoji the same way they would a real human face. In addition to grabbing people’s attentions, it has been found that some emoji can affect cognition, helping people remember a message more easily. It is no wonder, then, that emojis have exploded as a new source of innovation in classrooms. In recognition of the educational potential of emojis, some instructors are currently testing the use of emojis as part of new assignments. One example is Providence Arts Educator Tyler Horan, who recently developed an innovative “emoji pedagogy” for his one-week digital arts intensive class. In order to teach his Photoshop fundamentals class, covering tool bars and layers, he encouraged students to use website Emoji.ink to gain inspiration for their artwork, from which they were able to make connections to other artist’s work in the course. “I am always attentive to what my students are interested in. If my students are interested in emoji, I’ll teach emoji. It’s a new visual language imbued with so much meaning, but it also can be a tool for abstraction” reveals Horan. Another striking example of the emoji move into education is the GE Emoji Science website, complete with an Emoji Table of Content, Youtube videos and lesson plans. 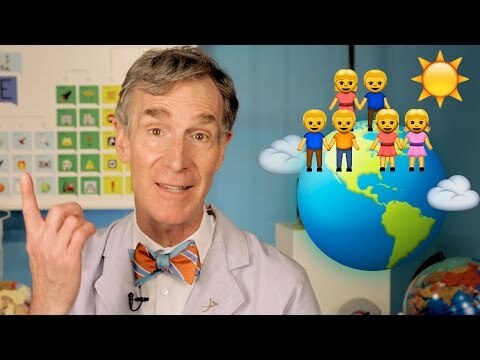 In the videos, science educator Bill Nye explains scientific concepts and theories ranging from climate change to evolution with the use of emojis. Nye adds emoticons from ‘meh’ to ‘shocking’ and ‘angry’ to his graph of carbon dioxide concentration versus time to illustrate how drastically carbon dioxide concentrations have risen in the past 260 years to over 400 parts/million. Condensed into 2-minute long videos, and complete with a fun background tune, it could be argued that these videos are too simplistic to do justice to a topic as complex and nuanced as climate change. Nevertheless, the familiar icons pique our attention. Even if just as a starting point, Nye’s videos and the GE Emoji Science website give insight into the potential direction of classroom activities for a new generation of digital students, particularly in elementary and middle school classrooms. At the Faculty of Education, various instructors employ visual language tools as the central focus of their classes. Language and Literacy Education Professor Dr. Kathie Shoemaker teaches a number of course with illustrated materials, from Introduction to Teaching Children’s Literature to Using Canadian Children’s Literature in the Classroom, among others. While the pictures in these illustrated books are evidently different to emojis, both in their printed nature and more intricate format, they are bounded by their ability to communicate a dizzying array of human emotions. As students’ interest in emojis inspires new innovative pedagogical techniques, we might start seeing small doses of class content transformed into this cheeky, but effective, visual language.